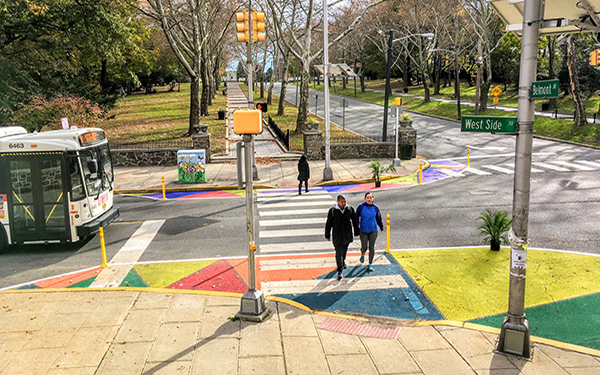 Street Plans was hired by the City of Jersey City to plan and implement six walkability workshops as a subconsultant to Fitzgerald & Halliday Inc. 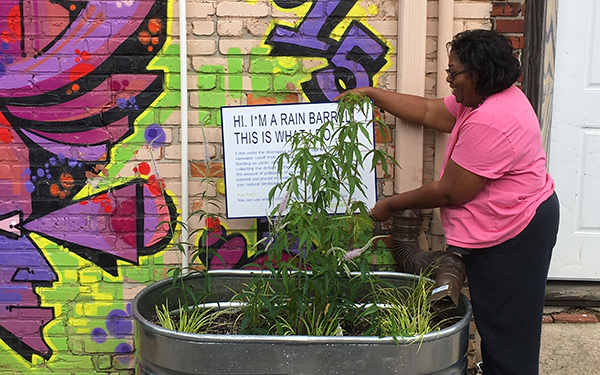 The workshops consisted of temporary curb extensions, including a public-feedback board, tables and chairs, wayfinding signage, planters, and colorful paint. The workshops gathered feedback from residents to inform the City of Jersey City’s forthcoming Pedestrian Enhancement Plan. Click here for more. 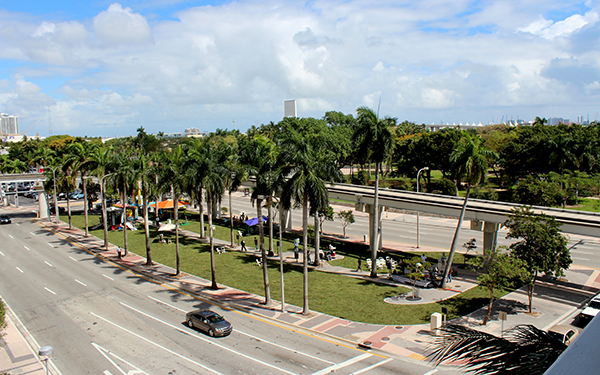 Biscayne Green was a three-week transformation of two parking medians along Biscayne Boulevard in Downtown Miami, FL. 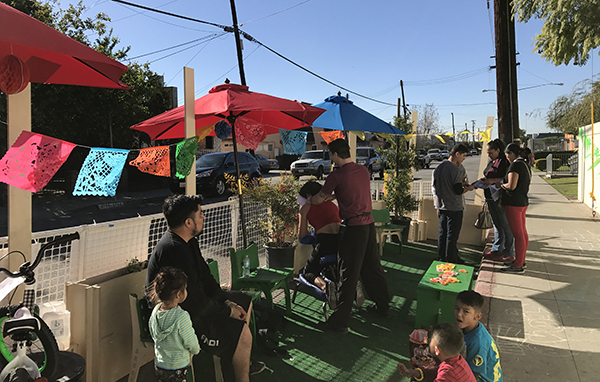 One parking median became a new pedestrian plaza, programmed with dance, music, and vendor events, while the other was comprised of a new playground, dog park, lawn, and seating terrace. The pilot project also included a dedicated bus and bike lane, and a new on-street parallel parking lane. Click here for more. 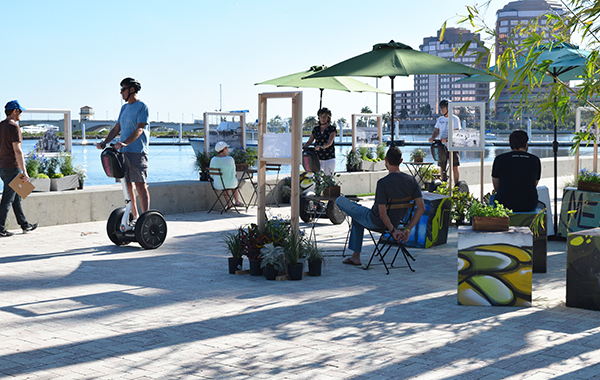 On January 24th, Street Plans implemented a day-long intervention along the waterfront in Downtown West Palm Beach. The project measured participants’ neurological responses to experiencing the pop-up space. The data will help reveal the possible wellness benefits of well-designed urban spaces, and inform how urban design affects the minds and bodies of those who move throughout it. Click here for more. Street Plans, together with Alta Planning + Design, designed and implemented 11 Tactical Urbanism projects as a part of the Southern California Association of Government’s (SCAG) 2017 Go Human region-wide safety and encouragement campaign. Click HERE for more. 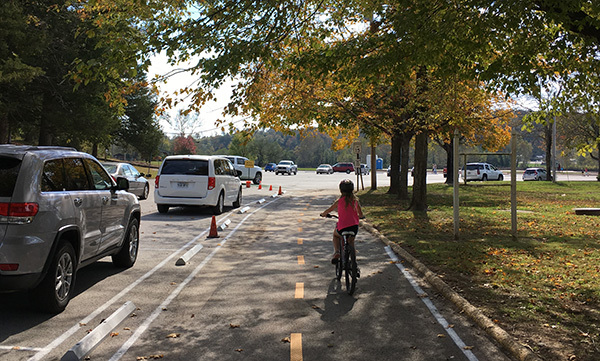 With financial support from the Walton Family Foundation and in partnership with the Bicycle Coalition of the Ozarks, Street Plans was hired by the Northwest Arkansas Regional Planning Commission to work with the cities of Bentonville, Bella Vista, and Rogers to create a series of month-long bikeway pilot projects. Click here for more. 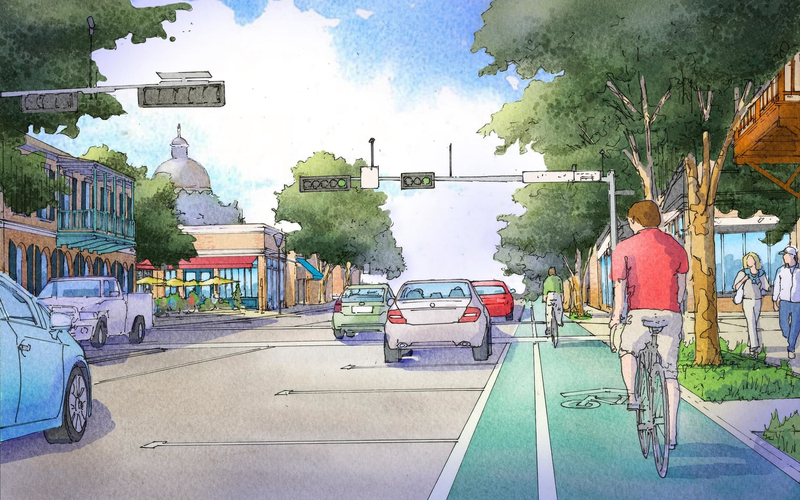 Street Plans joined the City of San Marcos and Dover, Kohl & Partners in re-envisioning downtown utilizing tactical urbanism, which included a temporary two-way lane conversion, a temporary two-way cycle track, a farmer’s market, and “pop-up” parks. This, along with a charrette, helped kick-off and inform the creation of a new form-based code. Click here for more. 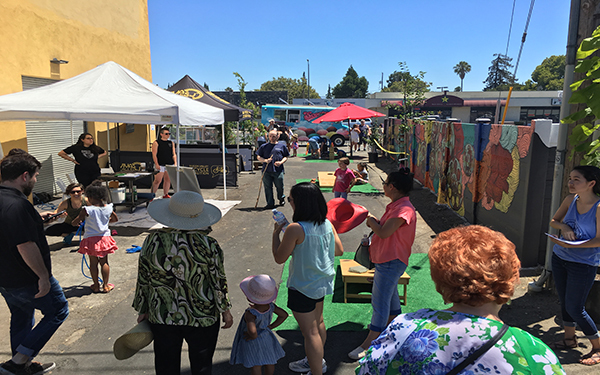 The Greenbelt Alliance hired Street Plans to lead two Tactical Urbanism Demonstration Projects in the West San Carlos and South Bascom Urban Villages of San Jose. 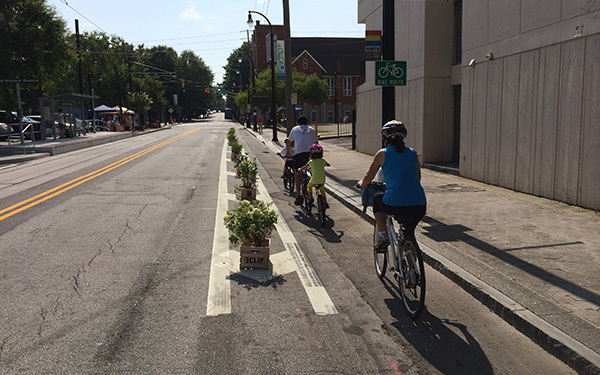 The first project was a two day demonstration project to improve bike infrastructure along Scott Street. The following project was a temporary "makeover" of a long-neglected alley. Click here for more. 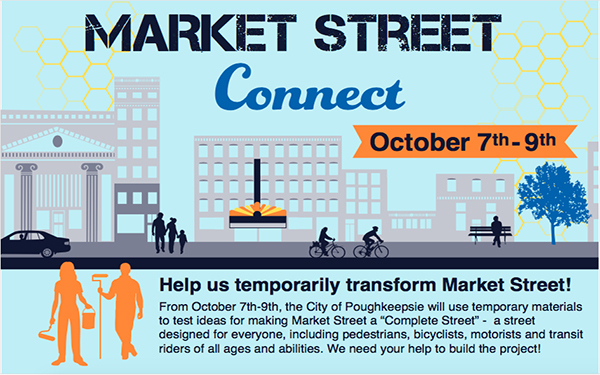 On Friday, October 7th, Street Plans worked with local volunteers and Sam Schwartz Engineering to re-imagine Market Street in Poughkeepsie, NY ’s downtown core for one day. 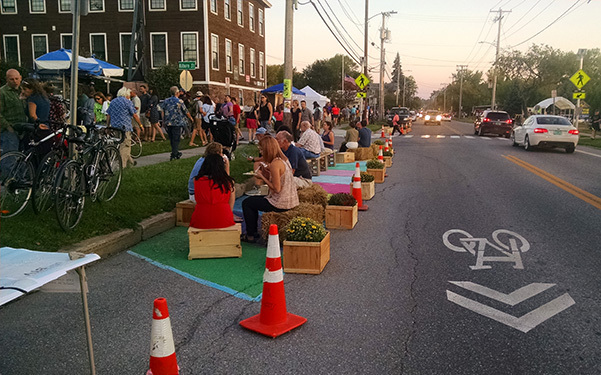 The project used temporary materials to experiment with traffic calming strategies, and reclaim space in the right-of-way for gathering. Click HERE for more. 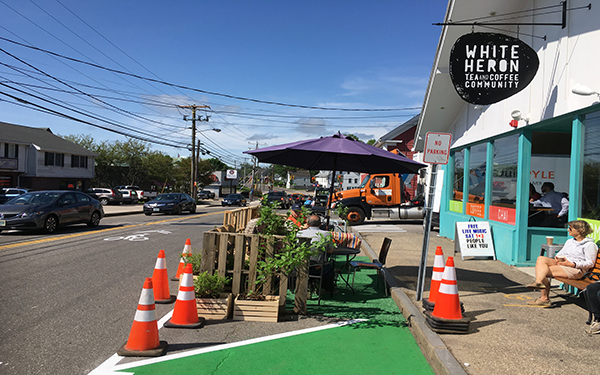 Together with PS21 (a local advocacy group), the City of Portsmouth, and many volunteers, Street Plans guided an effort to temporarily transform a block of Islington Street for four days. The goal was to show Portsmouth the change that is possible on their streets, increase civic engagement, and improve the safety and walkability of the area. Click here for more. 100 Resilient Cities partnered with Street Plans for the provision of “Tactical Resilience” workshops to the member cities of 100RC. The first of the three of these workshops was held in Norfolk, VA. The participants and workshop leaders installed four rain barrels, one rain garden, and depaved a sidewalk for landscaping/water retention. Click here for more. Monterey Road is a walkable commercial corridor in downtown Morgan Hill. 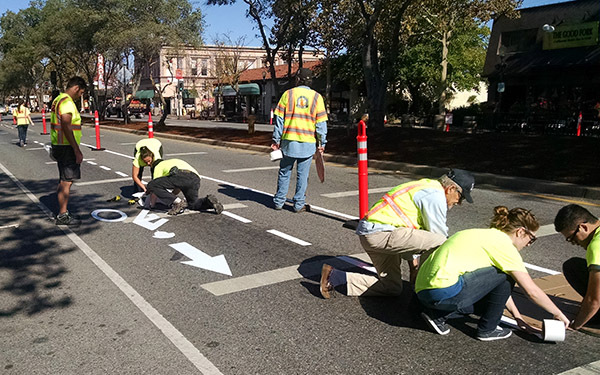 As part of a Complete Streets redesign of the roadway, Street Plans worked with Alta Planning + Design and the Morgan Hill Downtown Association to produce a weekend-long demonstration project that illustrated the two potential alternatives - one on each side of the street. Click here for more. The Atlanta Regional Commission (ARC) hired Street Plans to lead a demonstration project that temporarily transformed 3 blocks of Auburn Avenue in Atlanta’s Historic Old 4th Ward neighborhood into a model Lifelong Community – a healthy, walkable place with housing, transportation and service options for people of all ages. Click here for more. Together with DuBois & King, Streets Plans is leading Plan BTV Walk Bike - the citywide bike and pedestrian master plan for Burlington, VT. As part of the project, Street Plans worked with local stakeholders to create Tactical Urbanism “demonstration projects” that illustrated possibilities for better bike and pedestrian infrastructure. Click here for more. 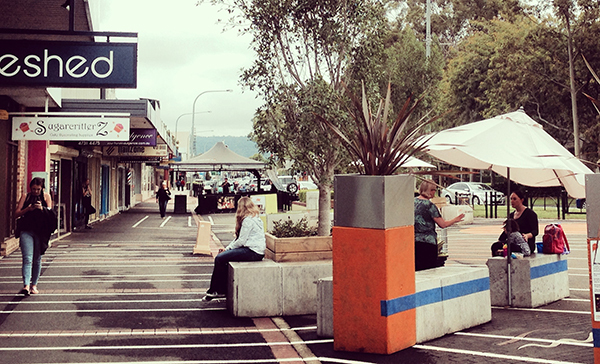 Street Plans worked with the Sydney-based consultancy Place Partners to integrate Tactical Urbanism into the implementation process for the High Street Master Plan. The goal was to work with businesses and community members to quickly design and deliver a temporary public park that would be in place for a one year trial period. Click here for more. 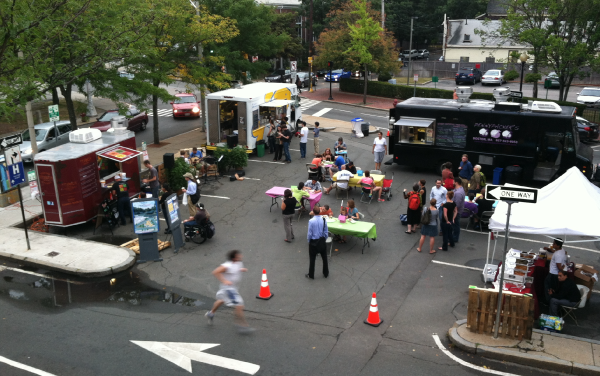 Street Plans was retained by the City of Somerville to assist with public outreach, transportation, street design, public space planning, and the integrations of Tactical Urbanism elements for the Davis Square and East Somerville neighborhood plans. Click HERE for more. 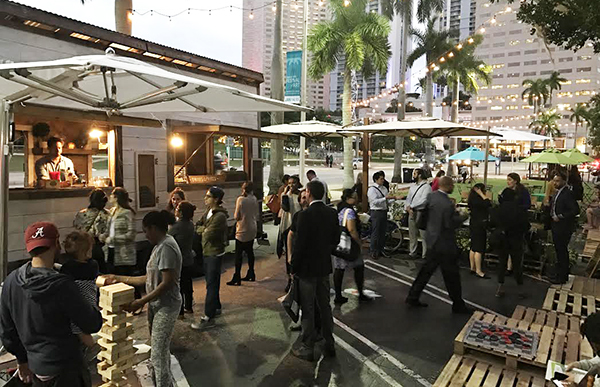 Bayfront Parkway was a one-week “living rendering” designed and organized by Street Plans that converted a median parking lot along Biscayne Boulevard into a pop-up park. Click HERE to see more. To see the next iteration of this project, see the Biscayne Green project page on our website. 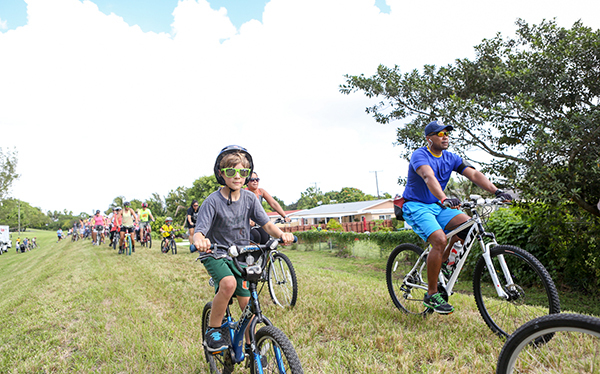 Street Plans Principal, Tony Garcia, is the co-founder and former chairman of the board for Friends of Ludlam Trail, a grassroots campaign seeking to transform an abandoned railroad into a linear park/trail. A formal charrette process led to a compromise for 75% of the corridor to be preserved for green space with a bicycle and pedestrian trail, and 25% of the land would be dedicated to mixed-use development. Click here for more. 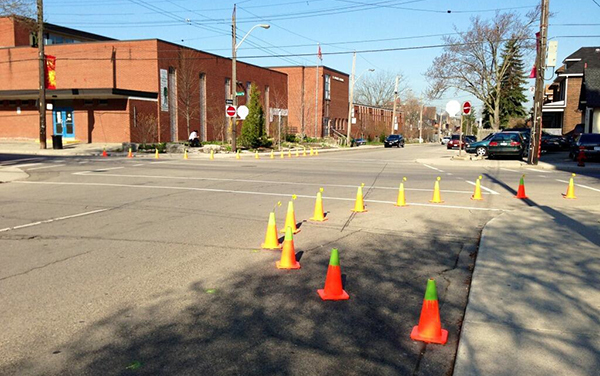 Street Plans led a Tactical Urbanism workshop aimed at five challenge sites found throughout Hamilton, Ontario. Workshop attendees developed and tested low-cost interventions at the five sites. The City of Hamilton initially pushed back, but within 6 months of the workshop more than 65 intersections, and now more than 100, had received city-installed pilot improvements, including the initial Locke/Herkimer Street intersection, which now has permanent infrastructure. Click here for more. 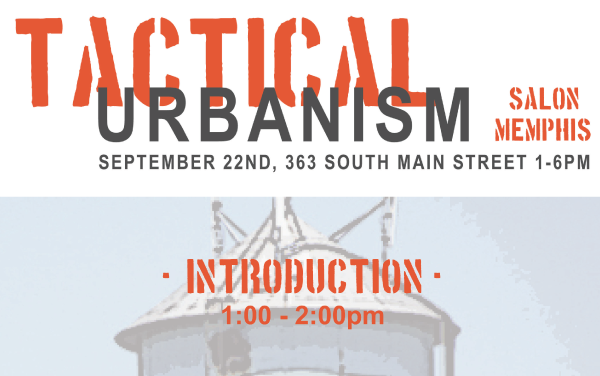 The Tactical Urbanism Salon travels to different cities to highlight and draw together individuals, organizations, and local government departments seeking new ways to overcome existing challenges in the built environment. Click HERE for more. 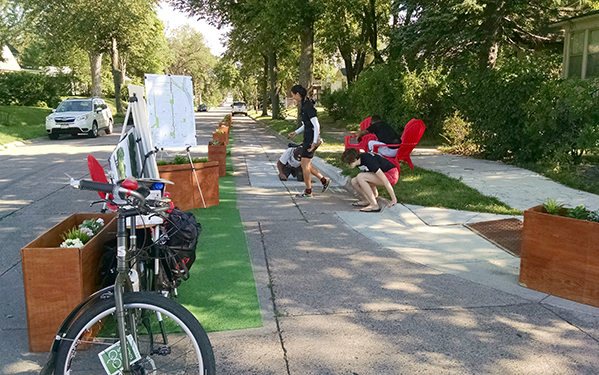 Street Plans worked with the Minneapolis-based organizations Wetland Habitat Restoration (WHR) and Juxtaposition Arts to lead visioning and design of a 6-month pilot project, which resulted in a 5-block demonstration of possibilities for a permanent greenway. Click here for more.